French animation giant Xilam and the makers of popular series – Oggy and the Cockroaches – has big plans for India, it’s fourth largest market, after securing a raft of sales in the region across kids’ catalogue. Europe’s one of the biggest animation company says it continues to make its mark in India with shows been sold to Nickelodeon, Disney Channel, Cartoon Network, Sony and local Indian video-on-demand (VOD) platforms including Amazon India, Alt Digital and Hungama. Xilam is widely identified as having creativity and expertise in the field of physical comedy and slapstick humour. According to Marc du Pontavice, Xilam’s founder and CEO, 2018 will be an important year for Xilam as it is moving into preschool with Paprika – its first property in the field. “We hope this launch will accelerate the growth of Xilam’s merchandising revenues. We are also planning to launch the first Oggy products in India, which we anticipate will please millions of fans,” he adds. It has selected its key property – Oggy and the Cockroaches – as flagship brand to establish a 360 approach in India. The series has strong brand awareness among kids and parents, says Marie – Laure Marchand, senior vice president of Xilam’s Global Consumer Products and Media Distribution. “We released Oggy season 5 (Oggy through the Ages) last August on Cartoon Network and have worked with them closely to prepare this launch with several mall activations, social media campaigns and an extensive school programme. We are seeing a massive support on social media with more than 1.3 million Facebook fans coming out of India alone,” she exclaims. To expand its brand experience in India, Dream Theatre has been roped in as the licensing agent. They represent Oggy and are now in discussions with several partners for Back to School, bags, publishing and accessories and collectibles. “We already have Play Planet on board which will be releasing the first Oggy plush next week just in time for Christmas, as well as Woodstock which has developed a very fun line of t-shirts sold online,” she adds. In 2018 Xilam plans to celebrate Oggy’s 20th Anniversary – an important year for the brand. Subscription video-on-demand or SVOD platforms are a strong accelerator in supporting Xilam’s growth, says Pontavice. “We already work with Amazon Prime India and Netflix and are looking at new business opportunities,” he adds. YouTube, in three years, has become an important component attributing to the revenues, Pontavice explains. “Although it’s only generating revenues for the library titles as premium, and is usually reserved for TV or SVOD, it accounts for a good third of our digital revenues. This is a precious tool through which we create a direct connection with our fans, allowing us to leverage cross promotional opportunities for merchandising and communication purposes,” he argues. Until recently the animation industry was heavily dominated by the US and Japan, and to a lesser extent by France, Canada and the UK. In the future, this market will become more of a multilateral one, with much content being offered by emerging markets like India, China and Brazil, he forecasts. “These territories are demonstrating there is a lot to learn and master with expertise in premium animation content,” he adds. It cannot be denied that Asia is fast emerging as Xilam’s key business model, even stronger than the US. “We have managed to establish very strong brands, including Oggy and the Cockroaches, Zig and Sharko, throughout the continent, and have successfully sold almost all our catalogue to TV. However, we have only touched the surface so far and we believe we still have important growth ahead of us, especially with the development of digital,” Pontavice feels. Ahead of its premiere next year, Xilam has already signed a presale for its brand new animated series Mr Magoo. As per plans, in 2018, Cartoon Network Asia will air the 78 x 7-minute series in Southeast Asia, Korea, Taiwan, Japan, Australia, India, India subcontinent, and New Zealand. 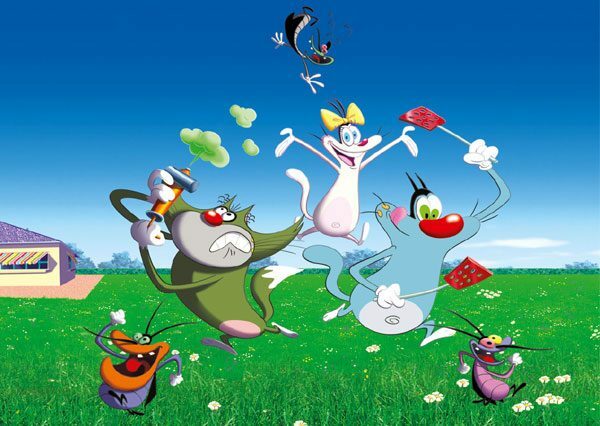 Cartoon Network Asia has taken seasons 6 and 7 of Oggy and the Cockroaches. The series is distributed in more than 160 countries around the world and is watched in 600 million homes. Chinese distributor Jetsen Huashi Wangju Kids has picked up the digital rights to season one of Xilam’s Zig and Sharko. The series is slated to be released in China across VOD platforms in 2018.